Greg Cameron, 53, an arts administrator and fundraiser. He formerly served as deputy director and chief development officer at the Museum of Contemporary Art, creating partnerships with LGBT groups. He has helped lead and fund several LGBT organizations and is now chief operating officer of broadcasters WTTW and WFMT. Greg Cameron has been an important part of Chicago’s civic life for more than 30 years. He has spent much of his professional life as a key player in Chicago’s cultural and arts communities and has taken every opportunity to bring LGBT rights and concerns to the forefront. 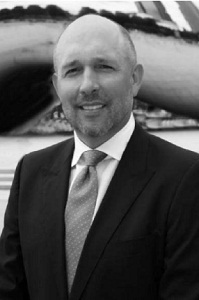 At the Museum of Contemporary Art, Cameron served as deputy director and chief development officer. During his years there, he worked tirelessly to incorporate gay- and lesbian-related topics into museum programming. He encouraged LGBT community voices on the board of trustees as well as in the MCA’s audience development and diversity activities (he helped to start the latter in 2001). Cameron also rallied MCA staff to display the AIDS Memorial Quilt for an annual Day Without Art and also made gay pride the annual focus of each June’s First Friday event. As chief development officer, he helped bring the art of AA Bronson, Jim Hodges, and Gregg Bordowitz to the MCA, providing a platform for discussing HIV and its impact upon the community. Cameron was also a force in partnering the MCA with About Face Theatre. Serving on the About Face board, on gala committees, and in an advisory mode, he helped the MCA and About Face to co-produce an ambitious new musical about Gertrude Stein, Loving Repeating, as well as I Am My Own Wife, which eventually went to Broadway and won a Tony Award for Best Play. On leaving the MCA in 2008, Cameron was honored with an annual internship scholarship in his name in recognition of his support of emerging talent. He has supported Center on Halsted and Chicago House, and he brought his star-studded address file and connections to the table for fundraising. His involvement with the HIV/AIDS communities has included board membership on the University of Chicago Comer Children’s Hospital’s Friends Against AIDS. Cameron also served on the board of the AIDS Legal Council of Chicago, where he excelled at fundraising. Since moving in 2008 to Window to the World Communication, Inc., which runs television station WTTW and radio station WFMT, Cameron has helped with strategic positioning of the acclaimed WTTW film Out & Proud in Chicago and has gone from executive vice president and chief development officer to become chief operating officer. Greg Cameron has been an exemplary leader who has made a difference. With his connections, position, and passion, he has had a powerful and positive impact on Chicago’s GLBT communities.